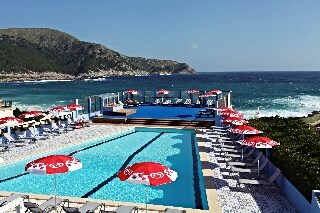 Mar Azul Hotel in Cala Ratjada has 76 rooms, spread over 6 floors. The hotel is located 200 m from the sandy beach. The closest city to the hotel is Arta (12 km). Other cities: Manacor (32 km), Palma De Mallorca (80 km). To make your stay more comfortable a lobby and an elevator are available. The staff in this 6 storey hotel speaks English, Spanish, French and German. For guests who wish to be mobile, bicycle rental, motorbike rental and car rental can be arranged. A fresh water swimming pool, seasonally open is available. Guests can unwind with a drink at the poolside bar. Sunshades and sunbeds are available for an additional fee at the beach and free of charge at the pool. Distance from the hotel to: Castillo Capdepera (4 km), train station (31 km), horse riding (600 m), airport PMI (80 km), disco (500 m) and Cuevas De Arta (12 km).